The NuWave Oven offers quick countertop cooking for a wide variety of dishes ranging from vegetables, casseroles, pizza, desserts and meats. The oven uses a combination of convection, conduction and infrared technology to speed up the cooking process. Furthermore, it allows you to cook frozen foods straight from the freezer without the need to thaw. Cook steaks with the NuWave Oven quickly and easily whether they are thawed or frozen. Prepare your steaks by seasoning as desired. Spray the steaks with water or cooking oil to ensure the seasoning sticks to the steaks, if they are frozen. Place the NuWave cooking rack in the oven so that it sits at the 4-inch height. Make sure that the liner pan is at the base of the oven before positioning the cooking rack. Place the steaks side by side but not touching on the cooking rack. Secure the NuWave Oven by placing the dome cover on the oven, turning it clockwise until it locks in place and fastening the base handles on both sides. Set the oven to cook your steaks one side at a time. Use the “HI” power level for each setting. For 1-inch fresh steaks, the cooking times for each side are five to six minutes for rare, six to seven minutes for medium rare, seven to eight minutes for medium and nine to 10 minutes for well-done. Add two minutes to the cooking time for 2-inch fresh steaks. For 1-inch frozen steaks, the cooking times for each side are 11 minutes for rare, 13 minutes for medium rare, 14 minutes for medium and 18 minutes for well-done. For 2-inch frozen steaks, the cooking times for each side are 15 to 17 minutes for rare, 17 to 19 minutes for medium rare, 20 to 22 minutes for medium and 23 to 25 minutes for well-done. Press “Start” and cook the first side for the allotted time. Open the dome by unsnapping the base handles and lifting off. Flip the steaks using tongs or a fork. Close the dome and repeat the process to cook the second side. Verify that your steaks are done by using a meat thermometer. 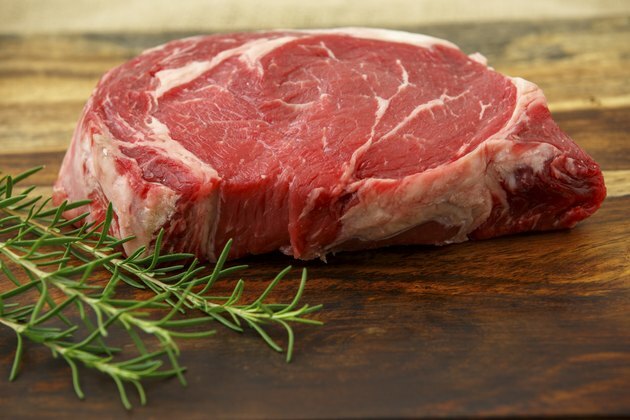 The internal temperature should read 135 to 140 degrees Fahrenheit for rare, 140 to 150 degrees Fahrenheit for medium rare, 150 to 160 degrees Fahrenheit for medium and 160 to 170 degrees Fahrenheit for well-done.